This is the best gluten free red velvet cupcakes recipe ever. Moist cupcakes with a hint of chocolate and vanilla. And that cream cheese frosting on top… You should make it! I developed this gluten free red velvet cupcake recipe last summer when I was running my gluten-free baking company, and then I never actually baked it to sell at the market. I guess red-velvet isn’t a big summer flavor, more for holidays and special occasions. Like Valentine’s day. 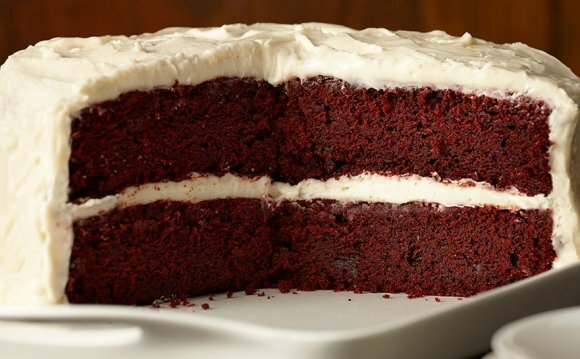 Red velvet is perfect for Valentine’s day. The very first Valentine’s day that I was married I spent the whole morning baking a special dinner for my hubby. I made a bunch of dippers for fondue, and baked several mini red velvet cakes with cream cheese frosting. I was really proud of myself for pulling it off, that week we were moving from our first apartment( a less than 500 sq foot studio) to our second apartment and I was 7 months pregnant with our daughter (we had been married 11 months.) I proudly served these cute little mini red velvet cakes that were covered in sweet cream cheese frosting and my sweet hubby only ate half of his. I had not yet discovered that he doesn’t like cream cheese, at all. So for him the cream-cheese frosting ruined the yummy red velvet. If you are like my hubby and don’t love cream cheese, feel free to use your favorite buttercream. If you aren’t a cupcake person, or a cake person, keep your eye out for my gluten free red velvet cake pops. UPDATE 2/2016 I have since made this recipe dozens more times. I made these gluten free red velvet cupcakes with my gluten free red velvet layer cake to serve at my sister’s wedding last spring. It got RAVE reviews from Gluten free friends and family, and gluten-eaters alike. I made a few adjustments to the gluten free red velvet cupcake recipe too, so they turn out even better. They really are the best gluten free red velvet cupcakes! This is the best gluten free red velvet cupcakes recipe ever. Moist cupcakes with a hint of chocolate and vanilla. And that cream cheese frosting on top... You should make it! Preheat oven to 350F. Line cupcake pan with paper liners. Mix together all the dry ingredients in a mixing bowl. In a large liquid measuring cup mix together all the wet ingredients. Add the wet ingredients to the dry ingredients and mix until combined. *I have used dairy-free milk with almost the exact same results. Of course, cream cheese frosting isn't dairy free. Either use a DF cream cheese substitute to make the frosting, or you could frost it with a traditional roux-based frosting, subbing in dairy-free milk and butter. I have made GF on a shoestring's recipe with dairy-free milk and I thought it turned out great. *I have used a flax egg substitute with almost the exact same results. For each egg mix 1 tablespoon ground flax seed with 3 tablespoons of warm water. Let it sit for 5 minutes to thicken before adding to the batter. For this recipe you need the equivalent of 2 eggs. I used 2 TBS of flax seed with 6 TBS of warm water.